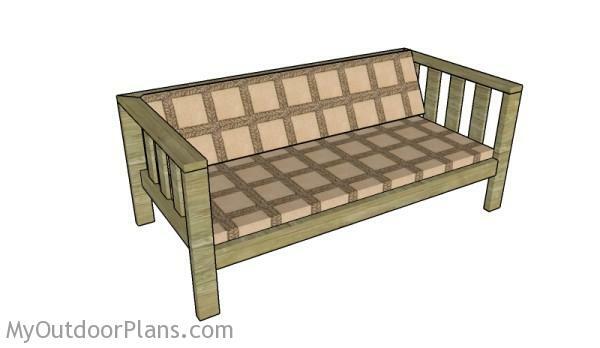 This step by step diy woodworking project is about backyard sofa plans. 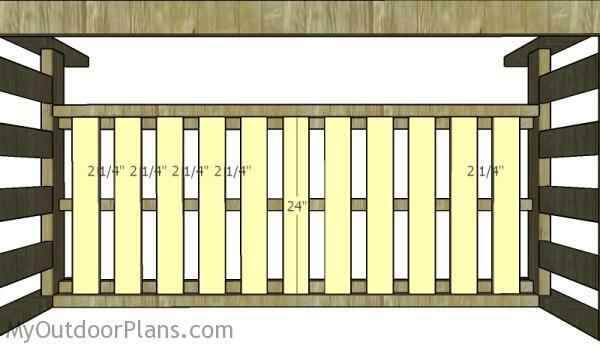 The project features instructions for building a 6′ wide sofa that is ideal for any backyard or patio. You can even use scrap wood or pallet wood to get the job done while keeping the costs down. Make sure you take a look over the rest of plans to see alternatives and more projects for your garden. Remember that you might need to adjust the size of the components to suit your needs. It’s that simple to build an outdoor sofa! The first step of the project is to build the sides for the outdoor sofa. 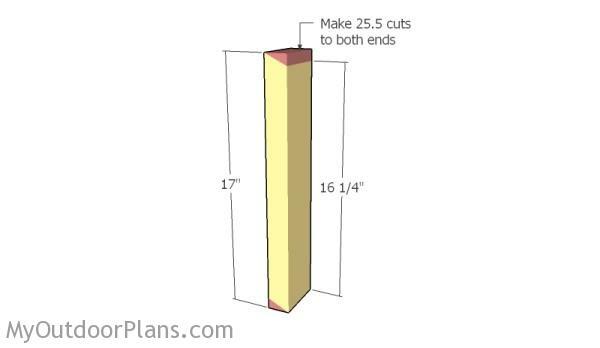 Cut the components from 2×4 lumber at the dimensions shown in the plans. Drill pocket holes at both ends of the horizontal components and insert 2 1/2″ screws into the legs of the sofa. Make sure the corners are square and align the edges with attention. 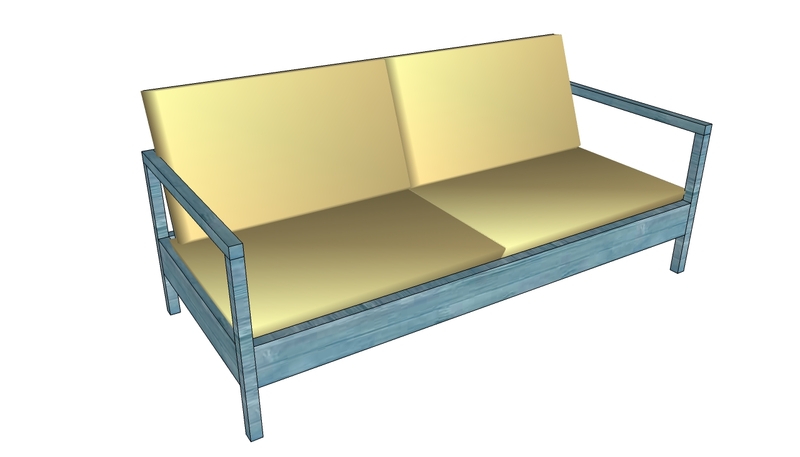 Next, you need to assemble the frame of the outdoor sofa by joining the sides of the sofa together. Cut the components from 2×4 lumber and drill pocket holes at both ends. Fit the supports to the sides of the outdoor sofa, as shown in the diagram. Make sure the corners are square and align the edges with attention. Insert 2 1/2″ screws to lock everything together tightly. 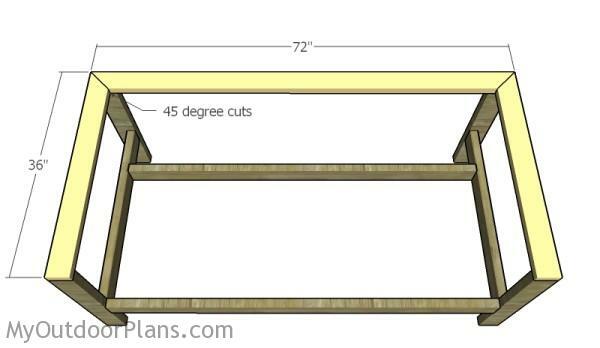 Continue the outdoor project by attaching the trims to the top of the legs, as shown in the plans. Make 45 degree cuts to join the components together easily. Align the edges with attention and lock the trims to the legs using 2 1/2″ screws, after drilling pilot holes. 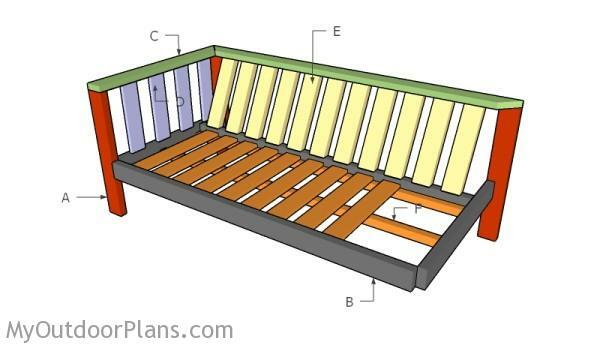 Fit the 1×4 slats to the sides of the outdoor couch, as shown in the plans. 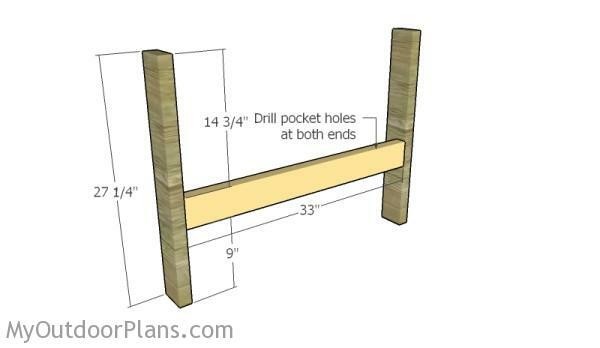 Drill pocket holes at both ends of the slats and insert 1 1/4″ screws into the frame of the couch. 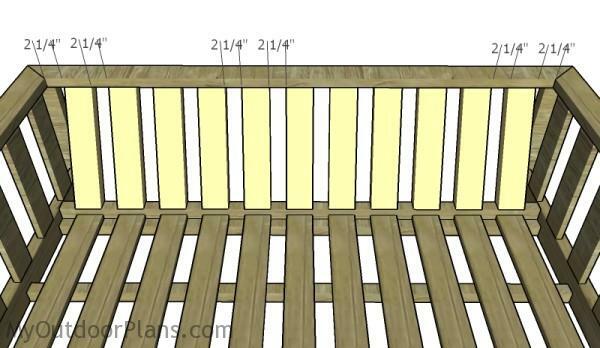 Place the slats equally-spaced for a professional result. Cut a piece of wood to use it a a spacer, if you want to create consistent gaps. Next, build the cleats for the couch from 2×2 lumber. 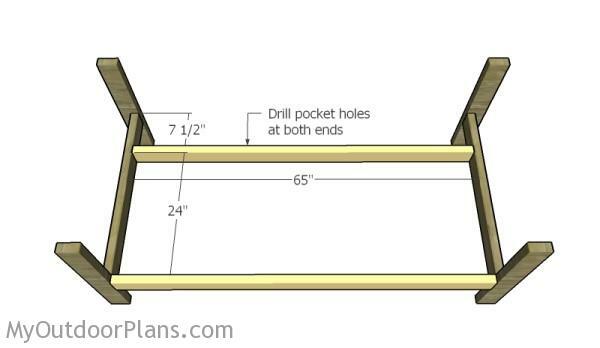 Drill pocket holes at both ends and secure them to the frame with 2 1/2″ screws. Make sure the cleats are horizontal before inserting the screws. Next, attach the 1×4 slats to the cleats, as in the plans. Use 1 1/4″ screws to lock the slats to the cleats. Place the cleats equally-spaced. One of the last steps of the project is to build the backrest for the outdoor sofa. 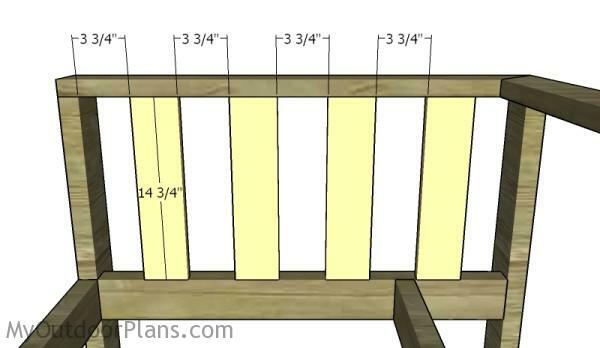 Therefore, you need to make 25.5 cuts to both ends of the slats. Fit the slats to the back of the sofa and lock them into place with 2 1/2″ screws. 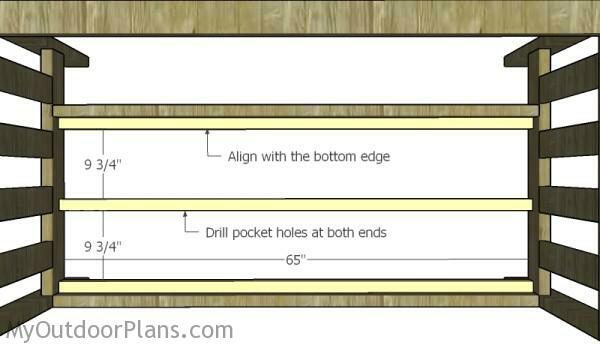 Drill pilot holes through the slats and secure them to the frame using 2 1/2″ screws. Drill pilot holes to prevent the wood from splitting. Fill the holes and dents with wood putty and let it dry out for several hours. Use 120-200 grit sandpaper to smooth the surface. Remember that you can adjust the design and size of the outdoor sofa to suit your needs. Fit some cushions to the backyard sofa to get the job done. Building a few of these sofas for your backyard patio is a great idea, as you will create a great conversation area. If you use treated lumber and apply the right products, you will enjoy the comfort of the sofa for many years in a row. 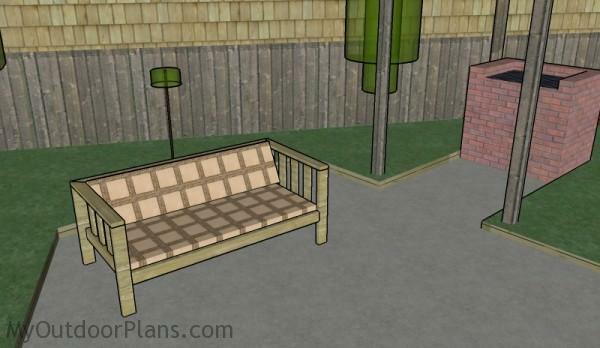 This woodworking project was about DIY backyard sofa plans. If you want to see more outdoor plans, we recommend you to check out the rest of our step by step projects. LIKE us on Facebook and Google + to be the first that gets out latest projects and to hep us keep adding free woodworking plans for you.